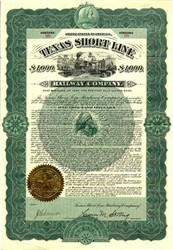 Beautifully engraved certificate from the Texas Short Line Railway Company issued in 1902. This historic document was printed by the Western Bank Note Company and has an ornate border around it with a vignette of a train at a station. This item is hand signed by the Company's President ( Henry M. Strong ) and Secretary ( J. B. Seeger ) and is over 106 years old. TEXAS SHORT LINE RAILWAY. The Texas Short Line Railway Company was chartered on February 28, 1901, for the purpose of building and operating a railroad from Grand Saline to a connection with the Missouri, Kansas and Texas Railway Company of Texas near Alba, a distance of about ten miles. The company had capital of $200,000 with the general offices in Grand Saline. Members of the first board of directors were E. H. Coombs of Denison; J. B. Seeger, Rudolph Gunner, and W. H. Van Wart, all of Dallas; Henry M. Strong of Battle Creek, Michigan; McGeorge Bunday of Grand Rapids, Michigan; and Charles L. Young of Jersey City, New Jersey. Construction began in 1901 and the Texas Short Line opened in September 1902. The railroad served the coal mines near Alba, owned by Seeger and his associates, and the salt mine at Grand Saline, owned by F. R. Blount of New York City and his associates. In 1903 the railroad reported passenger earnings of $1,000 and freight earnings of $16,000; that year the railroad owned one locomotive and seven cars. Despite the traffic provided by the salt works and coal mines, the company entered receivership on April 20, 1908, and was ordered sold. However, T. B. Meeks of Grand Saline and others acquired the various judgments, claims, and liens as well as the securities of the railroad, and the Texas Short Line was released from receivership without being sold. On May 7, 1910, the charter was amended to authorize the railroad to construct another mile of track at Grand Saline to connect with the Texas and Pacific Railway Company. The Texas and Pacific acquired the railroad in 1929, but the Texas Short Line continued to be operated as a separate company. Following the discovery of oil in Van Zandt County, a ten-mile extension from Grand Saline to Van, the center of the oilfield, was opened on July 10, 1930. A week later, on July 17, Governor Daniel J. Moodyqv addressed more than 700 people at a barbecue celebrating the new service to Van. In 1953 the Texas Short Line reported freight revenue of nearly $46,000 and switching revenue of about $43,500, but it had a deficit of $10,500. By then all equipment was provided by the connecting railroads. In 1959 the ten miles of track between Alba and Grand Saline was abandoned, and in March 1962 the line from Grand Saline to Van was also abandoned. "TEXAS SHORT LINE RAILWAY." The Handbook of Texas Online. [Accessed Sun Jan 25 10:33:02 US/Central 2004 ].